Designed by Swedish architects Hans Murman and Ulla Alberts, the Juniper House becomes barely visible, mirroring its surroundings with its facade. 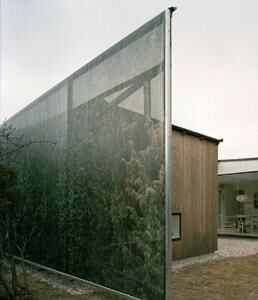 The facade is a playful comment on allowing modern architecture to be visual in the landscape. The house design allows for experiencing color, texture, surface, material, transparency and light on and through the facade. A photo of the existing junipers was used as the base for the tailor-made cloth that is 35 metres wide and three metres high and draped over three sides of the house. The netted vinyl cloth is on a galvanized steel construction at about 40 centimeters away from the facade.The resulting building becomes almost invisible and suddenly materialises and dematerialises depending on weather conditions and angle of view. This type of architecture can be interpreted as a more complex post-modern dialogue with context and history. Furthermore, it questions the nature, role and impact of architecture. Creating optical dematerialisation effects is part of the interchange with context and beholder. It is, however, also a will to be invisible, architecture of invisibility and transparency, ephemeral architecture in a sense, which disappears with the blink of an eye.